Bone and ebony plaques on a carcase of poplar, with an ivory finial. This hexagonal casket is made in North Italy, probably Florence, probably in the late nineteenth or early twentieth century. On the lid are representations of the Planets and on the sides of the Signs of the Zodiac. The facture of the casket and the style of the carving strongly suggest that this is a modern pastiche, with no known parallels. The iconography of the panels is also highly suspect: the gods and goddesses on the lid do not relate to the signs of the Zodiac below, and details betray them. Stylistically, the figurative panels are unconvincing as genuine medieval works, in particular the hunting putti of the lower borders. Florence is the most likely place of production. The sides are decorated with twelve panels with representations of the Signs of the Zodiac separated by twisted columns and pilasters with a vertical scroll pattern. Below, a frieze of animals and putti in a stylised landscape. 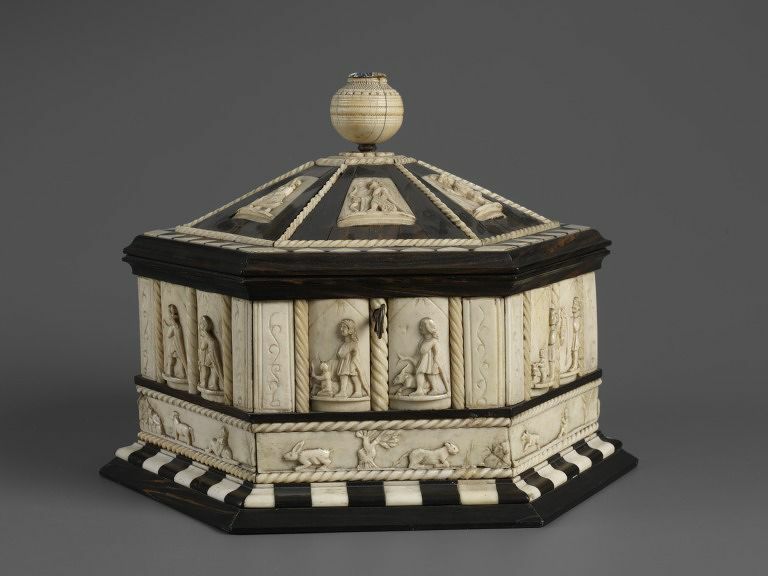 On the lid are Roman gods and personifications, some of them representing the Planets: Diana, Mars, Mercury, Venus (with Cupid), Time and Jupiter. The knob is a turned ivory sphere and has a small enamel attached to the top with a bust of St. Peter. The signs of the Zodiac are conceived as twelve female figures accompanied by an attribute. Acquired by Dr. W. L. Hildburgh in London in 1927; subesequently placed on loan to the Museum and given by Dr. W. L. Hildburgh, F. S. A. in 1952.